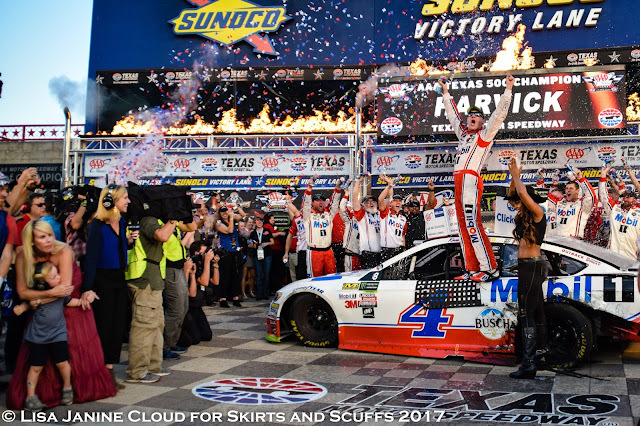 Keelan and DeLana Harvick look on as confetti rains on Kevin Harvick in Texas Motor Speedway Victory Lane. Kevin Harvick finally made it to Victory Lane at Texas Motor Speedway in the Monster Energy NASCAR Cup Series Sunday afternoon and in doing so secured his berth in the winner-take-all season finale. The driver of the No. 4 Mobil 1 Ford for Stewart Haas Racing has five Xfinity Series wins at the Great American Speedway, along with a Camping World Truck Series victory under his hat, but it took him 30 starts at the Cup level to be showered with Texas-shaped confetti while wearing a Justin cowboy hat. Harvick joins Kyle Busch as the only drivers to have won in all three top-tier national series. The victory is his second of the season and the 37th Cup win of his career, putting him at 22nd on the all-time wins list. After a 10-minute red flag to clean up from Kyle Larson’s fiery Lap 284 crash, Harvick started picking off cars as they wound through lapped traffic. “The last 50 laps were definitely entertaining from the inside of the car just because of the fact that I had to get by the 22, I had to get by the 11. Really lap traffic helped me get to the 78 quicker than I probably should have just because of the fact that he got held up a little bit. That allowed me to start seeing where his weaknesses were, adapted a little bit to the things that he was struggling with, trying to get into turn one and to the center of the corner. I felt like that was his weakness,” Harvick explained. DeLana hugs team owner Tony Stewart in Victory Lane. Martin Truex Jr. held on for second place after having led four times for 107 laps. Denny Hamlin led three times for a total of 65 laps and ended up third. Matt Kenseth wound up fourth, and Brad Keselowski bounced back to finish fifth after having a tire issue in the opening laps. Truex Jr. realized that he was vulnerable on long runs. “I knew he (Kevin Harvick) was quicker – once he got around the 11 (Denny Hamlin) I guess it was, he started coming really fast and that’s all I had. Just struggled a little on the long run today, which was normally where we’re our best. He seemed to be better when he got out front – we were good when we got out front toward the middle of the race and we just got too loose in those long runs,” Truex explained. In his final start at the track where he got his both of his first NASCAR national series wins, Dale Earnhardt Jr.’s hopes of winning one more time in the Lone Star State ended with a hub issue that sent him to the garage on Lap 243. He returned to the track on Lap 272 to finish the race in 35th, 30 laps down. Heading into Phoenix, three of the four finalist berths are filled. Harvick with today’s win, of course. Kyle Busch earned his with last week’s win at Martinsville. Truex Jr.’s stockpile of stage points lock him in, leaving Keselowski, Hamlin, Ryan Blaney, Chase Elliott and Jimmie Johnson vying for the last spot.